This maple nun’s sighs recipe, also called pets de nonne, or another rude name, is the delight of French-Canadian children. The traditional French recipe is for a light choux puff, but in Canada it evolved as a way to use leftover pastry scraps. This treat is brushed with butter, sprinkled with sugar, and rolled into spirals. The pastry spirals are then baked into crispy, flaky confections that are best eaten fresh and warm from the oven. Roll out the pastry dough into a 9-inch by 12-inch rectangle. Brush the butter over the dough, and then evenly sprinkle the sugar and cinnamon over the butter. Starting at the 9-inch end, roll up the pastry dough into a tight spiral. Slice it crosswise into 8 pieces, each slightly wider than 1 inch. 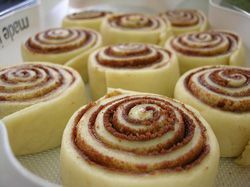 Place the pastry spirals, cut side down, onto the prepared baking sheet. Bake them for 20 to 25 minutes, until the pastry has turned light golden brown and the sugar is caramelized.